And now there’s more to worry about than just getting back home: The impossibility of altering past events has always been a core belief of time-travel theory—but it may be tragically wrong. When discrepancies in the historical record begin cropping up, it suggests that one or all of the future visitors have somehow changed the past—and, ultimately, the outcome of the war. Meanwhile, in 2060 Oxford, the stranded historians’ supervisor, Mr. Dunworthy, frantically confronts the seemingly impossible task of rescuing his students—three missing needles in the haystack of history. 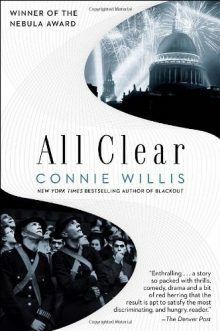 The thrilling time-tripping adventure that began with Blackout now hurtles to its stunning resolution in All Clear.